The stamps of Italy went through another major transition in 1900, with the accession of King Victor Emmanuel III. 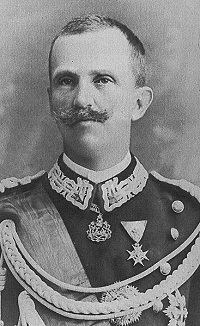 Vittorio Emanuele ascended to the throne on July 29,1900, at the age of 30, as King Victor Emmanuel III, following the assassination of his father, King Umberto I. During his 46 year reign, Italy became involved in two World Wars. His reign also encompassed the birth, rise, and fall of Italian Fascism under Benito Mussolini. Unfortunately, these events would be the death-knell of the Italian constitutional monarchy. After the end of World War II, the Italian people had become tired of the monarchy. and popular support for a republic was growing. In an effort to save the monarchy, King Victor Emmanuel III abdicated on May 9, 1946, and he was succeeded by his 42 year old son. King Victor Emmanuel III went into exile in Egypt, where he died on December 28, 1947. His son ascended to the throne as King Umberto II on May 9, 1946. About a month after his accession, a referendum was held in which the Italian voters decided to abolish the monarchy and to establish a parliamentary republic. King Umberto II then went into exile in Portugal, where he died in 1983. The new stamp designs shown above were issued between 1901 and 1926. These were the first definitive postage stamps of Italy issued at the beginning of the reign of King Victor Emmanuel III. These stamps are all typographed, perforated 14, and they are printed on paper with WMK 140 -- the Crown watermark. ﻿1 C. (1901 - Scott #76) - Brown. 2 C. (1901 - Scott #77) - Orange Brown. 5 C. (1901 - Scott #78) - Blue Green. 10 C. (1901 - Scott #79) - Claret. 15 C. on 20 C. (1905 - Scott #92) - Orange. 20 C. (1901 - Scott #80) - Orange. 25 C. (1901 - Scott #81) - Ultramarine, Deep Blue. 25 C. (1926 - Scott #82) - Green and Pale Green. 40 C. (1901 - Scott #83) - Brown. 45 C. (1901 - Scott #84) - Olive Green. 50 C. (1901 - Scott #85) - Violet. 75 C. (1926 - Scott #86) - Dark Red and Rose. 1 L. (1901 - Scott #87) - Brown and Green. 1.25 L. (1926 - Scott #88) - Blue and Ultramarine. 2 L. (1923 - Scott #89) - Dark Green and Orange. 2.50 L. (1926 - Scott #90) - Dark Green and Orange. 5 L. (1901 - Scott #91) - Blue and Rose. 10 L. (1910 - Scott #114) - Gray Green and Red. The 15 C. denomination stamp shown above was issued on March 20, 1906. This stamp is a complete departure from previous definitive postage stamps of Italy, in that it is a larger size, engraved, perforated 12, and unwatermarked. This stamp was issued in both sheet format and in booklets. ﻿15 C. (1906 - Scott #93) - Slate. The three designs shown above were issued between 1906 and 1919. As with previous definitive stamps of Italy, these are normal sized, typographed, perforated 14, and watermarked Crown. ﻿5 C. (1906 - Scott #93) - Green. 10 C. (1906 - Scott #94) - Claret. 15 C. (1919 - Scott #95) - Slate. This new series of lower denomination definitive postage stamps of Italy began appearing 1908, and their production continued through 1927. They are all typographed, perforated 14, and watermarked Crown. ﻿20 C. (1925 - Scott #97) - Brown Orange. 20 C. (1925 - Scott #98) - Green. 20 C. (1926 - Scott #99) - Light Brown. 25 C. (1908 - Scott #100) - Blue. 25 C. (1927 - Scott #101) - Light Green. 30 C. (1922 - Scott #102) - Orange Brown. 30 C. (1925 - Scott #103) - Gray. 40 C. (1908 - Scott #104) - Brown. 50 C. (1908 - Scott #105) - Violet. 55 C. (1920 - Scott #106) - Dull Violet. 60 C. (1917 - Scott #107) - Carmine. 60 C. (1923 - Scott #108) - Blue. 60 C. (1926 - Scott #109) - Brown Orange. 85 C. (1920 - Scott #110) - Red Brown. Redrawn types of the March 1906 larger sized definitive stamps were issued between 1909 and 1917. They all have differing attributes. The 15 C. denomination's design is 23 mm high, instead of 25 mm high. These redrawn stamps are typographed, perforated 13 x 13 1/2, and they are unwatermarked. The first 20 C. denomination is also typographed and unwatermarked, but it is perforated 13 1/2 x 14. The second 20 C. denomination is typographed, perforated 14, and it is printed on paper with the Crown watermark. ﻿15 C. (1909 - No Wmk - Scott #111) - Slate Black. 20 C. (1916 - No Wmk - Scott #112) - Brown Orange. 20 C. (1917 - Wmk - Scott #113) - Brown Orange. A re-engraved type of the 15 C. stamp of 1906-1909 was issued in October 1911. It is shown above at the left. The designs of these stamps are 24 mm high. They are perforated 13 1/2 and unwatermarked. In 1916, the 15 C. denomination stamp of 1911 was re-valued with a new value of 20 C. It is shown above at the right. ﻿15 C. (1911 - No Wmk - Scott #123) - Slate. 20 C. on 15 C. (1916 - No Wmk - Scott #129) - Slate.